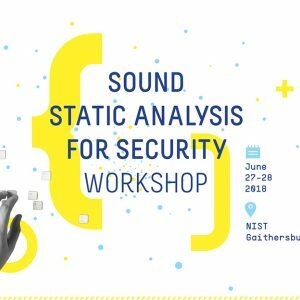 ​AdaCore has been working with CEA, Inria and NIST to organize a two-days event dedicated to sound static analysis techniques and tools, and how they are used to increase the security of software-based systems. The program gathers top-notch experts in the field, from industry, government agencies and research institutes, around the three themes of analysis of legacy code, use in new developments and accountable software quality. Here is why it is worth attending. ​SPARK user Alexander Senier presented recently at BOB Konferenz​ in Germany their use of SPARK for building secure mobile architectures. What's nice is that they build on the guarantees that SPARK provides at software level to create a secure software architecture based on the Genode operating system framework​. They present 3 interesting architectural designs that make it possible to build a trustworthy system out of untrustworthy building blocks. Almost as exciting as Alchemy's goal of transforming lead into gold! Here is the video of that presentation. Every year, free and open source enthusiasts gather at Brussels (Belgium) for two days of FLOSS-related conferences. FOSDEM organizers setup several “developer rooms”, which are venues that host talks on specific topics. This year, the event will happen on the 3rd and 4th of February (Saturday and Sunday) and there is a room dedicated to the Ada programming language. The Adaroombot project consists of an iRobot CreateⓇ 2 and Ada running on a Raspberry Pi with a Linux OS. 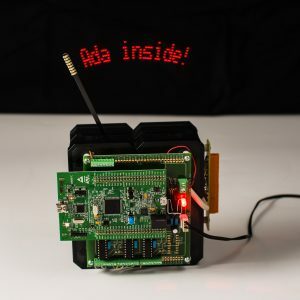 This is a great Intro-to-Ada project as it focuses on a control algorithm and a simple serial communications protocol. The iRobot CreateⓇ 2 platform was originally design for STEM education and has great documentation and support - making it very easy to create a control application using Ada. This blog looks at the creation of the project and some cool features of Ada that were learned along the way. While searching for motivating projects for students of the Real-Time Systems course here at Universitat Politècnica de València, we found a curious device that produces a fascinating effect. It holds a 12 cm bar from its bottom and makes it swing, like an upside-down pendulum, at a frequency of nearly 9 Hz. The free end of the bar holds a row of eight LEDs. With careful and timely switching of those LEDs, and due to visual persistence, it creates the illusion of text... floating in the air!